A description of the Blackwall Tunnel. 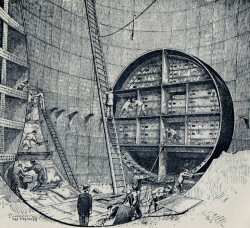 The Blackwall Tunnel between Greenwich and Blackwall was built in 1891-7 and designed by Sir Alexander Binnie. It was only the second tunnel to be built beneath the Thames (the first being Sir Marc Isambard Brunel's famous Thames Tunnel). It was driven using a Greathead tunnelling shield and compressed air, a combination of techniques used for the first time on this project. The tunnel was lined with cast-iron segments filled with concrete and faced with white-glazed bricks. The contractors responsible were S. Pearson & Son who issued this comprehensive account of the undertaking, reprinted from the journal, ' London ', as a souvenir booklet. Oblong 8vo. 31 + (1)pp, 2 plates and many text ills. Orig. wrappers, printed in gold with 'With Messrs. S. Pearson & Son’s Compliments’', lettered across the top of the upper wrapper.